A 9mm, Ultra Wide, Long eye relief eyepiece was placed on an f/5, 6" refractor and a hand-held Afocal image was taken with a Fujifilm F-450 compact camera in monochrome mode. Click opn an image to get a larger view. A Pentax K-x DSLR was fitted with an extension tube and a UV/IR cut filter and placed at the prime focus of the 6" refractor. 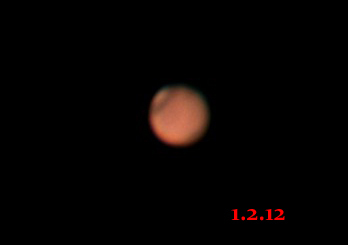 A DBK21 camera was attached to an 11", f/10 SCT. The Moon was imaged afocally using a fixed focus compact camera and a 9mm ultrawide, long eye-relief eyepiece and a 127mm, f/10 Maksutov. Overlapping regions were imaged and combined into a mosaic with Microsoft ICE. An SPC900 webcam fitted with a UV/IR cut filter and a 2.5x Barlow was fitted to the Maksutov. 7200 AVI frames were captured at 10fps using wxAstrocapture under Linux at 1800 frames per AVI. The AVIs were Stacked in Registax 4 under Wine under Linux. 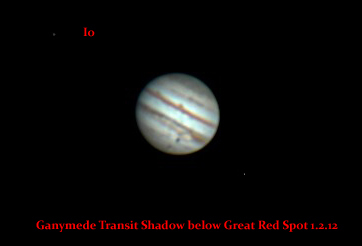 1800 AVI frames were captured at 10fps of Jupiter. The AVI was processed in Registax. 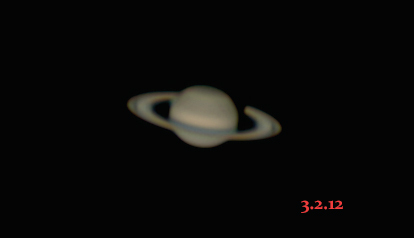 An SPC900NC webcam was connected to a Skywatcher Evostar 90 refractor. A DMK21 camera fitted with an IR/UV filter was attached to a 2.5x Barlow in a Coronado Solarmax ll, 60 BF15 and AR1410 was imaged under poor seeing conditions. Images were colourised to represent the wavelength of light being used. Prominences on the limb were also imaged and a virtual occultation disk has been used on the solar disk. 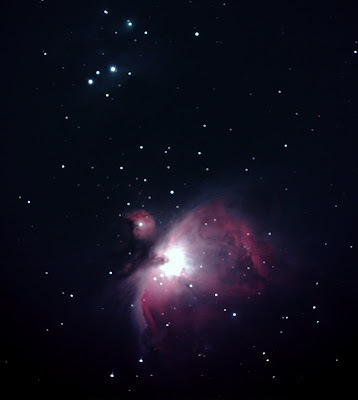 The Orion nebula was imaged through a guided, 120mm refractor using a Nikon D700. The 6.3 focal reducer has been fitted to the 12" LX200 SCT so that deep-sky viewing will provide brighter, wider field views. The object of this evening's experiment was to find out if there is enough back focus in the system with the focal reducer fitted for imaging to be done. It will be a simple matter to remove the focal reducer so that planetary viewing and imaging can be done. The 67% waxing gibbous Moon was imaged in 4 overlapping sections and a mosaic was made using Microsoft ICE. The DSLR would not come to focus with the star diagonal in place but with a visual back attached to the focal reducer, the DSLR could be brought to focus. For objects smaller than the Orion Nebula, the vignetting would not be a problem as the vignetting could be cropped from the image. The image above was cropped but still shows vignetting at the corners. 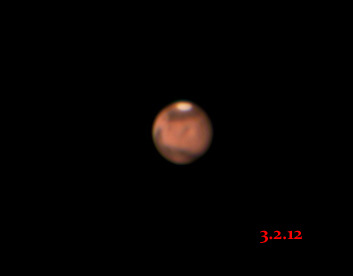 The image above is a stack of a number of different exposures of different lengths and different ISO settings. The Moon was imaged in overlapping sections which were combined into a mosaic with Microsoft IXE. This demonstrates that a cheap, fixed focus camera can be a very effective lunar imager in combination with appropriate eyepieces.